Hi all, I know it's been a while since my last post. I've been so insanely busy. My salon is doing so well and we are busier than ever, but I had to make the hard decision to let go of a few techs. We're now recovering, as a few new techs I hired turned out to be very nice and professional. Plus, some of my students are ready to take their exams, and they are also helping out in the salon and getting more experience. 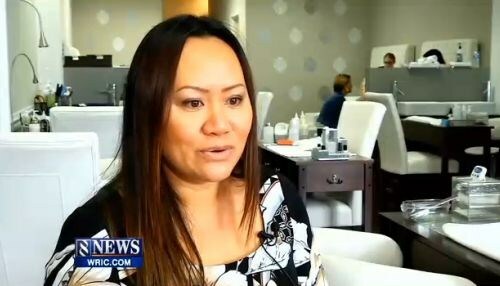 Also, recently our loving board of cosmetology had so many complaints about unsanitary salons and people getting infections that there was a was a TV news story done about "nail salon danger". And Polished Nail Lounge was featured in that story. Thank God we were featured as where to go in a good way :)! LOL. You can watch the story on WRIC's website. We're trying our best to educate our employees and clients, and we know that as long as we do things right, our hard work will pay off, and of course, our phone was ringing off the hook :)! I'm preparing myself to go to Florida for Premiere Orlando [www.premiereorlando.biz]. It would be nice to get away and enjoy a little time with my family as well. That's all for now -- enjoy this beautiful season and I can't wait to share with you about my trip. — Tina, Polished Nail Lounge, Richmond, Va.